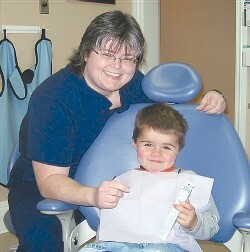 Dental visits are fun and educational! It is important that the first visit is a positve experience for your child and it's important to get an early start on dental care so that your child will learn that visiting the dentist is part of health care. Be sure to get an early start on regular dental care at home. Start cleaning your child's mouth with a soft, damp cloth before teeth come in and continue with a soft toothbrush once he or she has a first tooth. Limit the number of sugary treats you give your child, and focus on healthy food choices from the very beginning. For kids, the dentist is looking at issues guiding the development of oral health, and making sure parents and children know how to care for little teeth. They're looking into things like thumb-sucking and appropriate management of sports injuries. For older adults, dentists are paying special attention to the rate of gum disease. And for everyone, they're drowing a very significant connection between nutrition and the rate of problems with the teeth.